It is a very different look to the 2016/17 Euroleague season. The FIBA Basketball Champions League will place some pressure on this tournament while many fans will be desperate to see what the Eurocup and FIBA Europe Cup have to offer, but in terms of European basketball, it remains all about the Euroleague and the Race to the Final Four. There is always a lot of excitement at the start of a new season and with this new-look Euroleague, a great range of teams will genuinely believe that they have a chance of being a winner. This is highlighted in a promotional video clip created by Euroleague which carries an Ocean’s 11 style theme. There is clearly a massive prize at stake and the winning team will consider it to be a bit of a heist. If you have seen the film (either the original or the remake), you’ll know that a casino looms large in the story. That’s where plenty of money can be found but it is also the ideal arena for the most talented sports stars of their era and genre. There is obviously a bit of luck involved with many casino games but there are also plenty of casino games that involve skill, determination, bravery and an understanding of the flow of the game. In this light, you start to realise that the magic of basketball isn’t a world removed from the majesty of the casino and the video from the Euroleague makes a bit more sense. Okay, it is still quite silly, but that’s a good thing as well. It helps to show some of the best basketball players in a different light, which can never be a bad thing about spreading the word about the new season and what is in store for the people that love European basketball. There has also been a follow-up video which highlights the Euroleague trophy being moved to a secret location where it should be safer. In this video, you have some of the coaches from the leading European basketball clubs scouting its whereabouts. One coach will get his hands on the trophy next summer but who will it be? The rank outsiders going into the new season are Zalgiris Kaunas and Crvena Zvezda who can be backed at 301.00 if you believe that there is going to be a massive upset. 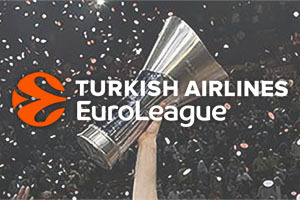 The campaign gets underway very soon which is fantastic news for the Euroleague basketball fans who have endured a lengthy summer without their heroes. The new campaign begins on Wednesday 12th of October when Real Madrid play at home to Olympiacos Piraeus with a 9pm BST/CET tip-off. There are three games taking place on Thursday 13th of October and the Euroleague 2015/2016 Champions will be in action in one of these games. There are four games taking place on Friday 14th of October which means that there will be a great deal of excitement taking us into the weekend. The second round of fixtures in this season’s Euroleague campaign come in the following week and there will be four games on the Thursday evening and then a remaining four games on Friday evening. Week two of the regular season sees two recent champions clash in Tel Aviv while the clash between Olympiacos and Anadolu Efes should be a thrilling affair. The reigning Euroleague champions are in action at home for the first time this season while the Barcelona and Fenerbahce clash should be a fantastic game. If you have been counting down the days to the Euroleague, the wait is almost over.